ST. GEORGE — With the help of a witness, St. George Police officers were able to confirm the cause of a two-car collision at 100 South and River Road Thursday. At 2:49 p.m., a young adult male driving a red Honda Civic was traveling eastbound on 100 South and ran a red light. A Jeep Patriot traveling northbound on River Road, driven by a woman with her young son riding as passenger, hit the Honda. 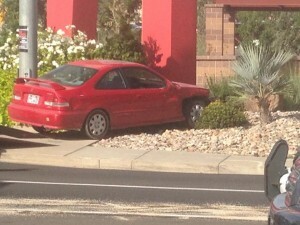 After colliding with the Jeep, the Honda was knocked off the road into the nearby Red Rock Commons shopping center sign. 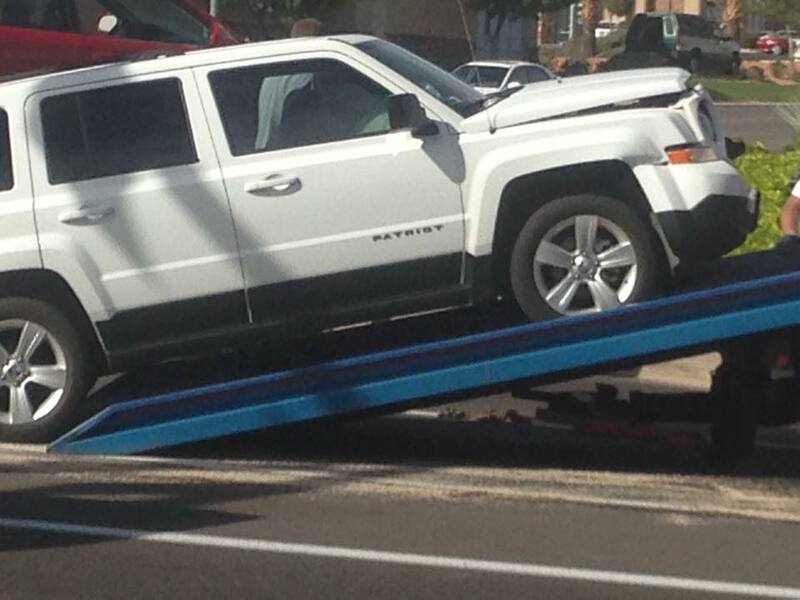 The driver of the Jeep told officers the traffic light had been green when she drove through. The Honda driver initially told officers he wasn’t certain what color the light had been when he entered the intersection, but he later told St. George Police Officer Jamison Hale that his light was green, Hale said. Because the witness had been stopped at the red westbound light at the time of the accident, that proved the eastbound traffic light, through which the Honda driver had traveled, also had to be red, Hale said. This provided further confirmation that the Honda driver had run a red light. 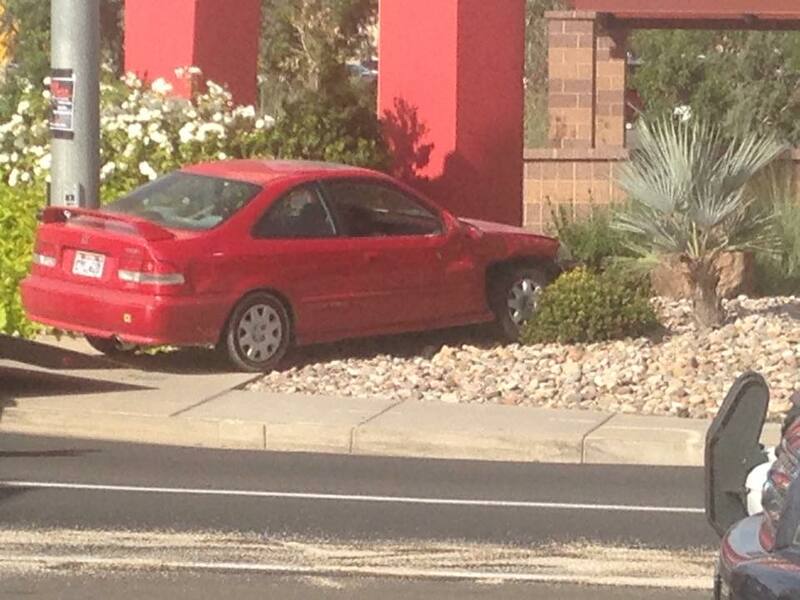 The Honda driver was cited for failure to yield to a traffic signal, Hale said. Without a witness, the driver of the Jeep could have been held accountable in the accident and been forced to pay for damages through her own insurance company, Hale said, causing her insurance rates go up when she wasn’t at fault. “It’s not fair for somebody who runs a red light and causes the crash to get off without his insurance taking care of (the other) person’s damages,” Hale said. The Jeep driver had a swollen wrist due to airbag deployment and the Honda driver complained of a sore left shoulder after smashing against his driver’s side window during the accident. Both drivers refused medical transport. Damages to the vehicles included right front tire damage and a possible broken tire axle to the Honda and a smashed up driver side on the Jeep. Both cars were towed from the scene. Traffic at the east end of 100 South was delayed by the accident and was directed by St. George Police officers during the accident cleanup. Just by looking at the cars you can tell it was the Honda driver’s fault. Only a reckless kid would drive a red Honda Civic, and a responsible adult is the driver of the Jeep (sarcasm). Turns out to be correct this time. Just because West Bound had a red light didn’t mean East Bound was red. East Bound has Turn arrows. That would allow East to be Green and West to Be Red. East and West have left turn and through lights that run independent of each other. The witness can’t prove anything. In southern Utah, the one most likely at fault would be the less worthy of the two.